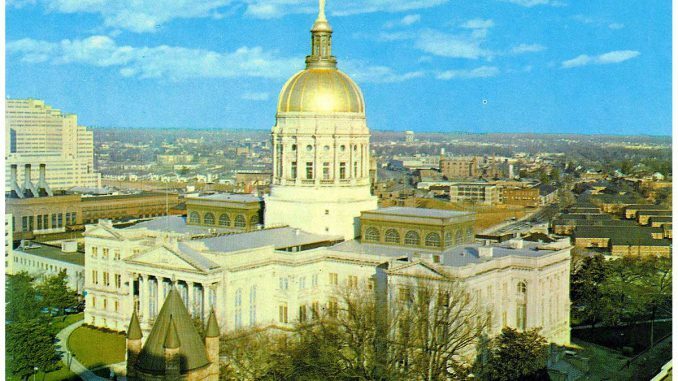 Visiting the Georgia Capitol information – Making Connections. Finding Solutions. Entrances: Visitors in wheelchairs may enter the Capitol from the loading zone off of Mitchell Street and from Martin Luther King, Jr. Drive via ramps which provide access to the first (ground) floor. The MLK entrance on the first floor is actually an employee entrance, but if you ring the bell they will open it to let you in. Elevators: The elevators are located on the east and west sides of the Capitol. The elevators are fairly small though and since there are only 2 in the building you may have to wait on a busy day. Restrooms: Wheelchair accessible restrooms are located on the first, third and fourth floors of the Capitol building. Facilities for ladies are located on the first floor, inside the Capitol Avenue entrance and on the third floor in room 342. Mens’ facilities can be found on the first floor and on the fourth floor adjacent to the House Gallery. There is a tiny little café on the 1st floor of the Capitol near the Governor’s office. It mainly has snack type items and drinks. Around lunchtime they usually have Chick Fil A sandwiches for sale also. There is a full cafeteria (food court style with sandwiches, Mexican, Chick Fil A) in the Twin Towers building which is diagonally across from the Capitol on the corner of MLK and Capitol Ave/Piedmont. There is another full cafeteria in the Coverdell Legislative Office Building (CLOB) across Mitchell Street/Capitol Sq (physical address is 244 Washington Street). It is located on the 6th floor and is open from 7 am to 2 pm. If you go into the Coverdell building you can get to this cafeteria without needing a special badge, but it appears that it is intended for employees only because when we have left the cafeteria we were not able to get out without a badge to open a door. You will find someone sympathetic who will let you out. ￼It can be very difficult to get good reception once inside the Capitol, so don’t be surprised if you miss calls or texts while you are there. Your battery will also drain very fast if your phone is constantly having to search for service. Please dress appropriately when visiting the Capitol. We typically tend to dress in professional dress, business casual or wear t-shirts supporting our cause. Please don’t wear anything with marijuana leaves or other pot symbols since we are working hard to show that what we are supporting has nothing to do with the typical images of marijuana use. Sometimes our kids are with us at the Capitol and sometimes it is much easier to leave them at home. Typically when we have a press conference or larger event, many of us will bring our kids because it helps for people to see them and it definitely encourages the media to promote our cause. When we are there for a committee meeting or a vote on the House or Senate floor it can be a long day especially if things don’t go according the expected schedule, so we often don’t have kids with us. Your children are always welcome, but use your own judgement about whether it is practical for you or if you feel like they would be a distraction to you or others. Feel free to bring a picture of your child if they are not coming with you. When speaking to your legislator about a child, you can at least show them the picture. Be respectful of everyone you encounter – whether they are a legislator, staff, security, etc. Please don’t yell at them or raise your voice even if you don’t like what you’re being told. It doesn’t mean you can’t disagree when someone is refusing to support our cause or has misguided information, but try to have a rational conversation without it getting too heated. Many of us developed very positive relationships with our legislators last year and in some cases strong friendships have developed. We know some of them are crazy and will never support us, but please try to win them over with kindness whenever possible. Groups that lobby at the Capitol definitely get a reputation and we want to make sure ours continues to be positive. When session is in progress, the daily schedule will be posted in advance on the House and Senate websites (http://www.house.ga.gov and http://www.senate.ga.gov ). The House and Senate typically start their day at 10 am in their respective gallery. They go through a lot of ritual each day. They recognize groups and people from around the state (high school basketball teams, high school scholars, beauty queens, community members that have done something worthy or are being memorialized, etc.). This can go on for quite a while and often the legislators are walking around the floor talking to each other, on their phones or computers, or otherwise just not paying attention. Then they have a pastor of the day that essentially gives a 15-20 minute sermon. After all of these activities, then they will actually start the more official business of the day. Bills that were “dropped” or introduced the previous day will be assigned to a committee by the Speaker of the House or Lieutenant Governor. Bills that are ready for a vote will be debated on the floor with legislators speaking for/against the bill. When an actual vote is about to take place, a bell will ring to let the legislators know that they need to come in to be present to vote. Once the daily session completes (typically late morning or early afternoon), the legislators are dismissed and most of them will have committee meetings to attend in the afternoons. Most of the committees have somewhat standard days/times that they meet each week, but the agenda for each meeting will be different depending on what bills are up for discussion. These committee meetings can sometimes last into the evening. Everyone that works at the Capitol wears a nametag. The Representatives have maroon name tags. The Senators have dark blue name tags. Staff members and interns have a different color. If you happen to see your rep or senator wandering the halls, don’t hesitate to stop them and introduce yourself. There are always a lot of lobbyists wandering the halls too. Most of them have official nametags because they have registered as a lobbyist. None of us have registered as lobbyists although some parents were there enough last year that they possibly should have. As long as we’re not giving money or gifts to legislators, we should be okay. Every legislator has an office, but they don’t spend a lot of time there during the day when session is in progress. Some have their own space, while many of them are in a shared space and may share an executive assistant. Some of their offices are in the Capitol building (typically those with more seniority and leadership positions) while others are in the Coverdell Legislative Office Building which is directly across from the Mitchell Street entrance. If you schedule a meeting with your rep or senator or would like to stop by their office, make sure you pay attention to the location that is listed so that you go to the right building. Even if you do not have a meeting scheduled or have already met your legislators, it’s not a bad idea to stop by their office and introduce yourself to their executive assistant or legislative assistant (intern). Getting to know those people can be very helpful if you need to get a meeting set up or when you are calling their office to remind them that you want their support of a bill. The legislator may brush you off, but if you (or your child) can leave a lasting impression with those people then that can make a difference in the end. The House chamber is located on the west side of building and the Senate chamber is located on the east side of the building. The main entrance for the floor of each is on the 3rd floor. That is where the legislators go in and where you can go to try to meet them. The main floor of the chambers is typically off limits to anyone that is not with a legislator or has a press pass. A legislator may take you or your family onto the floor or at least into the entrance area for a photo with the official photographers, but that is by invite only. Anyone can watch the proceedings from the galleries which are located directly above each chamber on the 4th floor. There are guards at the doors to tell you when you can or cannot go in. There are certain times when the doors are locked to prevent people from moving about. You are typically asked to go in the center doors only but you can exit through the side doors also. If you need a space for a wheelchair or stroller, the people at the door should help you. If you go into the gallery, make sure you keep your phone off or on vibrate. If you are using it while you are in there, they will likely ask you to put the phone away or leave. They will also not be thrilled if you have a child that is making a lot of noise. The best way to meet or talk to your rep and senator is to call them out on the ropes outside the chambers. Whether you have had any response from them in the past or not, it’s great to meet them this way so that they get that personal contact with you. There is a desk directly across the main entrance of each chamber where there will be some ladies that have little slips of paper for you to fill out. You write the name of the legislator, your name and what you want to speak with them about. Based on the kind of response you’ve received in the past you can decide what you want to say in order to make them most likely to come out rather than blow you off. Definitely make sure that you put your name though. Also be sure that you are on the right side – House for the Representatives and Senate for the Senators. It can be very crowded at the desk, so you may find it easier to walk away to fill out the slip and then bring it back to them. You may have to wait in line to hand over your slip. The ladies at the desk will summon a page (typically a middle or high school kid that is serving for the day) to take that slip of paper to the legislator. You can find a place to wait along the ropes so that they can find you. The page will either come back to let you know that the legislator said they will be out to see you or they may have a response written on the slip of paper to indicate that the legislator can’t come out. It is possible that they will just say they are busy to avoid you! The legislator will likely only spend a minute or two talking with you since there is business going on inside and other people may be paging them also. Hopefully you can get them to come out at least to meet you, but please be respectful of their time. You can use this as an opportunity to request a planned meeting with them or maybe a phone call if you don’t feel like you were able to establish a good connection during that short conversation. It will be very crowded outside the chambers on days when there is a lot going on. It can be difficult to get through all of the people waiting at the ropes, especially if you have a child in a stroller or wheelchair. ￼￼￼￼Take I-75/85 North to Exit 245 (Capitol Avenue). At the bottom of the exit ramp, continue straight through the stop sign. At the first traffic light, turn left onto Hank Aaron Drive. Take I-75/85 South to Exit 248A (Martin Luther King, Jr. Drive). Bear right onto Martin Luther King, Jr. Drive. Take I-20 East to Exit 56B (Windsor St./Spring St./Stadium). At the third light, turn left onto Central Avenue. ￼Public parking is available in several locations surrounding the Capitol. There are some metered spots along the streets near the Capitol, but those are hard to come by. Early in the morning some of the spots on Mitchell Street may be available and there are some handicap spots there. There are also several parking lots that are open to the public if space is available. Parking fees vary by lot and most require that you pay in advance at one of the kiosks in the lot. It will ask you to note either the spot # you parked in or your tag number so that it can print it on the ticket which you will then put in your front window. You can select the amount of time that you’d like. Most of the lots are a minimum of $9-10 for a few hours. Warning: If you go over the allotted time even by 1 minute, there is a good chance your car will be booted! • Steve Polk Plaza Parking lot is located on M.L. King, Jr., Drive just past Washington Street, one block northwest from the Capitol. There are two kiosks to pay, so pay attention to the spot number you park in and then go to the kiosk to pay and get a ticket which you put in our window.